The film opens in 1989 after the kidnapping of six-year-old Martin Bristol. Bound and gagged, he's forced to watch as his abductor stabs and tortures a woman to death. Fast forward to 1999. Our protagonist, Julian, is up to his eyeballs in debt. Owing a bookie hundreds of thousands of dollars that he doesn't have, Julian's girlfriend, Marilyn, gets him on board for a bank robbery along with her recently paroled brother, Max (who has the REALEST scar I ever saw [see very end of review]) and their wish-washy accomplice, Kurt. Of course, their intel of the bank was wrong and there were more security guards than expected, resulting in Max making his getaway with a nasty gunshot wound to the chest. Though they've safely escaped, Max doesn't survive for long, leaving Julian and Marilyn by themselves to find the safe house that Kurt previously picked out. Speaking of Kurt, the tire on his getaway car has blown out halfway to the spot, forcing him to steal a van (not to mention the mother and her young daughter inside of it). Once at the safe house (an abandoned two-story house in the middle of nowhere), Kurt begins to divvy up the loot, hoping to stash away a little more for himself before the rest of the team arrives. 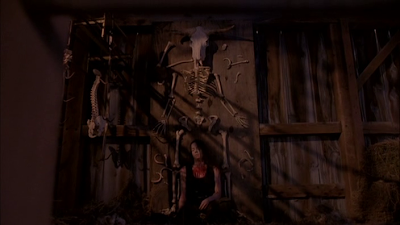 Unfortunately for him, the little girl puts a kink in his plan when she escapes, hiding in a rundown meat and poultry slaughterhouse. It's here where Kurt meets his demise at the hands of a nasty killer. A killer who's been waiting many years for someone to enter his hunting grounds; the same hunting grounds where Martin Bristol was forced to watch unspeakable acts of evil ten years before. With Julian and Marilyn only a skip away, the cops are no longer the worst thing that could find them. Malevolence plays like a forgotten horror film of the 80s, from the moody synthesizer soundtrack to its simple plot mechanics. There isn't truly much that goes on in this film. People rob bank, people hide out, killer stalks people. It's a very basic premise, but it somehow remains entertaining throughout. While it draws a large amount of influence from Halloween and early Friday the 13th films, it still manages to hold its own, although some editing and musical cues are taken directly out of Carpenter's original blueprint. Some may call it an homage, others may call it a rip off. I let it slide because this was Mena's first film, and those usually tend to pay tribute to the director's personal favorites while finding a comfort zone and style of their own. The acting is passable, but won't be winning any awards. Technically speaking, the real highlight of this film comes in the form of Tsuyoshi Kimoto's cinematography. The beginning of the film is presented through a series of lavish wide angle shots that unfortunately fail to carry over into the rest of the story. However, Kimoto does a wonderful job of capturing action in cramped locations throughout the rest of the film. 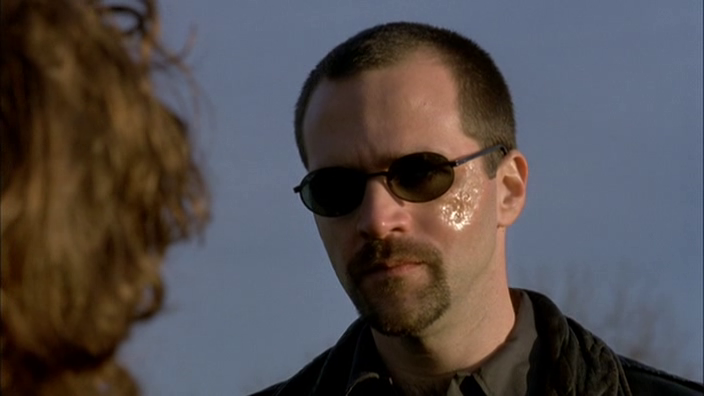 It also doesn't hurt that Malevolence was shot on 35mm film, as this captures the crisp beauty of the middle-of-nowhere locale that may have been lost on a low budget digital camcorder. The gore is very scant, but in a surprisingly successful way. 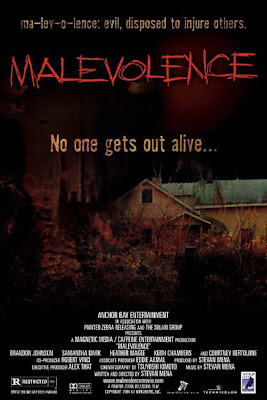 Similar to the how The Texas Chainsaw Massacre had very little blood but felt extremely violent, Malevolence follows suit with mostly stabbings that are never presented in an over-the-top sort of way. Utilizing the less-is-more approach, many of the kills feel brutal, even though we're seeing very little of what's happening. 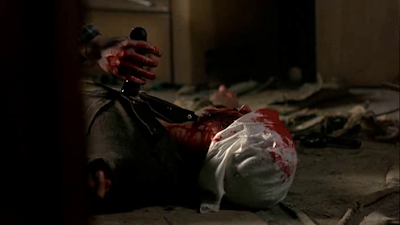 Altogether, Malevolence is a better-than-average low budget horror film. If you can get past Mena's attempts to pay tribute to past horror faves, you may find yourself interested in the actual storyline by the end of the film (the plot doesn't really show up until then). Don't forget, although this was Mena's directorial debut, Malevolence is actually the second story in the trilogy. With Bereavement serving as the prequel, there should be enough backstory to keep slasher fans interested until the final chapter is released. I just hope that doesn't take another seven years. "Just tell me....does my scar still look super real?" Thanks for the link! I do believe I've visited your site quite a few times this past year. Keep up the good work! I love seeing other indie-horror enthusiasts working together! PS: I take many image captures of films myself. Feel free to use them if you're ever reviewing a film with very few images online!